Today is Friday...and the first day of my vacation! Sweet! Today we're going to go do some...shopping!! My mom gave me $200 in gift cards to reitmans to buy some new clothes (thanks Mom!!) - so we're going to head to the Reitman's Outlet, so hopefully that $$ goes a little bit further. We also have to go to the vets (I have to find an equine vet in this city first), to pick up the vaccinations I'll need for Starlight. She'll be here in 4 more days!! I'll probably have to spend about $75 on vaccinations (I already bought the de-wormer somewhere else). I'll be giving her the shots myself, so that will save me about as much as the vaccines cost themselves. I haven't given her shots for a few years, but I'm sure it will be fine. Like riding a bike, not something you easily forget how to do. We also have to do some grocery shopping today, not sure if that will fall to me or Jordan - but we'll figure it out. I have about $40ish left for groceries so I can pick up a few things. I also want to go to the Hertiage park this weekend, or some other touristy thing - that won't be today, but sometime this weekend. Well, that's about it - it'll be a spendy weekend. Hopefully my gift cards, jars, and whatnot prevent me from using that credit card. Here's hopen i've planned well. "I've always been bothered how money is such a taboo subject for most - it's cool you could relate to your boss like that!" Why is money such a taboo? I beleive that has been written about a LOT, I thought about answering the question - what can we do to change it? Well as PF bloggers, I beleive that we have already started knocking down the Money Taboo barriers. Seomthing in us, something in our upbrining or what we've experienced (nature? nature?, im inclined to believe nuture) - has elimited money as a taboo of ours. I am going to try to have at least one conversation about money each week. The conversation should be with someone who I wouldn't ordinarily speak with about money. When I'm successfull, I'll post about it and let you know how it's going. Managed to squeeze in a few more hours over the last few days. Today I got 2.0 rather then 2.5 due to a company function, and yesterday I got 2.5hrs. So not bad. Hopefully tomorrow I can get another 2.5. Unforutnatly, the main part of my OT project is pretty much over. I'm going to talk to Boss and Boss Jr. about this next week to see if there is anything else I can do, but that could be it. Right now I have enough hours to net me abooouut $250ish, which would wipe out one of my CC repayments. I'm going to hold off though, and request the payout once this weeks hours have been added to my 'bank' (this weeks hours will be banked by about Wednesday next week). I will requst ALL of my hours so far to be paid out for the following pay period. After that, I will probably still try to get a few hours in here and there, but there won't be quite the drive for it. Having a few banked hours is almost like an 'extra' Efund or safety net; as if I were to get laid off - they would have to pay out all remining time. ; and if I had overdrawn on Vacation time; that could take care of it (I haven't, but you never know). We'll see how it all shakes down next week. I have read a lot about the debt snowball technique. Dave Ramsey appears to beleive that you should pay down your debt with the smallest amount owing and work your way to the largest amount owing, thus giving yourself a mental boost in acheiving some small goals quickly . Gail Vaz Oxlade appears to beleive that you should pay down your debt with the greatest interest rate first, so that your debt costs you the least amount of money in the long run. Whichever way you pay your debt, we (PF bloggers everywhere) GET that the snowball techniques works very well. Has anyone considered a savings snowball?! Once my credit card is paid off, which will be in the next 8 weeks, I want to reach my savings goals as quickly as possible. I want to do this to have peace of mind, and to be able to seriously consider amalgamating my and Jordan's finances together, in whichever way winds up working best for us. Above and beyond the house fund contributions, I figure I will have about $500/month to put towards the various savings goals I have. This is what I came up with for my savings snowball, what do you think? I may change the details a bit, but I wanted to put this out as an idea. By the end of next year (2010), I will have saved and paid for two christmases, met my E-fund goal, and met my first tier RRSP goal (if I follow this plan) & be ready to join finances with Jordan (unless we find a way to reach our goals together, before then). Have you ever tried a savings snowball? Do you think their are phycological benefits to trying to reach your smallest savings goal first, and then building your way to the largest savings goal? So I just had the coolest conversation with my boss, ever! He made a comment about my open toe shoes, which we are not allowed to wear at work because it’s a health & safety concern. I said something about ‘it’s not in the budget this month’ but that I would work it in soon. That little tidbit of sharing had him launching into what he and his wife do to manage their finances. He said that he and wife have used the mason jars for a great number of years. They’ve since moved on to just tracking their expenses via an excel spreadsheet, but the principals are the same. They weren’t in crazy debt – and the reason for that, is they have always managed their money, tracked their spending, had goals – and met them! I told him that I had actually just started on the ‘magic jars’ (he hadn’t heard of Gail Vaz Oxlade! ), last pay day, and so far so good! He said the great benefit, is when both you and your partner (*cough *cough, Jordan) are on the same page with them. He also said, make sure you’ve got a bit of fun money in there too! Jordan and I were talking the other night about the possibility of getting a joint credit card (not tomorrow - but one day). We thought we could use this joint card for things like: groceries & shared fun stuff. When the bill comes in, we could split it right down the middle. This way we don't have to worry about who's paying for what, and who's turn it is to buy what. He recognized that I often pay for things and he's often forking over cash. I don't like keeping tabs and asking for money, and he doesn't like asking me how much he owes. So - I kind of like the idea of a joint card - we talked about how it would not be used for any personal items, no gas, no gifts ect. We then got to talking about what things could look like if we put all of our finances together in the future. I put together a spreadsheet of what it COULD look like. *** Joint Fun - would be taken out in cash, represent a credit card, or be tracked by hand and spent via debit. This would probably also include 'other' house related items, when we buy things for our hobbies (fish). ect. What do you think? Have you joined finances with someone before? On the drive back to Alberta yesterday, Jordan and I were talking about our house fund goal. I had orginally put $35,000 as our goal for a down payment - I just sort of decided, with out putting to much energy into it. Just to get us started. We have our eye on my aunts home, which she stated she would want about $250,000. From what I can gather from the CMHC, we would pay insuance equivilant to 2.75% of our mortagage loan ($250,000 less the down payment) for insurance - approximately $6,875 if we had less then 20% down. So, our tiered goals are shown in the following little picture. Teir one, has our current monthly contributiones ($150, every week). In this graph, I'm assuming that about once every year we will increase our contributons by $25/each a month. This may or may not happened - depending on circumsatances, but I'm going to role with it for now. Oh, how I love pay day! All (or just about all) of my automatic transactions have already taken place. MY VISA DEBT IS NOW A MERE $940!!!! That's over 70% of the way to my goal!!! I've updated all of my tracking bars, as well as my NetworthIQ badge. Jordan and I are heading to my hometown this weekend, right after work today - See you all on Monday!! So i've been working on implementing the jar system, and found out what my weekly amounts would be. The numbers just wern't jiving. But wait! I budget on a bi-weekly basis. silly jessie. Here's what the next two weeks will look like. Green type is what's coming in, Red type is what's going out and green highlight has already happened. These leaves me with a little bit of $$ left over for things like my mom's birthday (Happy Birthday Today Mom!) and our trip to my hometown this weekend. That extra Vpayment you see there, is because I put groceries on my visa last night instead of using debit - silly me, old habits are hard to break. I also argued with AMA a bit, but I have to pay for their annual membership to have insurance with them. I'm defninately going to be doing a lot of posting about vehicle insurance come renewal time. Also - my horse board might be a little less the $90, it'll probably be $81, but I'll budget for the full amount just in case. I feel like I'm forgetting something, but time will tell. I printed off lables for my jars, woohoo! :D I just got my paystub for tomorrow's pay. I've got enought $$ from my OT to put an additional $300 towards my visa (as promised). So as of 12:01am tonight, or rather tomorrow morning - I will owe about $940 on my credit card! 8 weeks after that the debt WILL BE GONE! On top of that, my grandma gave me a little $$ for my birthday. What that means is I have $150 for my jars for July 24th to August 6th and $150 for August 7th to August 20th. Plus, after next pay period I should have $150 left over to cover any additional horse-related costs. So Yay Me! I do have 10 hours banked, and I'll probably be able to put in an additional 10 next week that I can request to be paid out the following week. I'm happy this morning! My Mantra for the next few weeks: do not use your credit card, do not use your credit card, do not use your credit card....there, hopefully that helps. Hi my name is Jessie . I currently have $60 dollars in my wallet. When I started managing my finances I was worth -$7,499, and now have a net worth of -$2,145. I currently work in Human Resources and have been doing it for one year. I make roughly $45,000 per year. I want to have enough money to be comfortable waiting for me when it comes time to retire. Aside from learning about finances, I really enjoy horse back riding, quading, camping, & spending time with friends and family. I think the world would be a better place if poverty didn't exist. I had Arbys (thanks for buying Jordan) for dinner last night and it was kind of bland. I have had a few significant others over the course of my lifetime, and none hold a candle to my partner Jordan. One thing that makes me different is my passion and comittment. Now that I'm done with this mad lib, I think I'm going to get back to work (it's my lunch break). My E-transfer came through, and I put another $850 towards my visa debt, as promised. I've updated my tracking bars to reflect the change on my CC debt, and the much, much lower balances on my Efund and Christmas fund. I just have to remind myself that it will only be a month or two before I can put $$ towards those again. No, this is not my horse; however, she might have one that looks just like this little guy! Thats right, she might be pregnant. 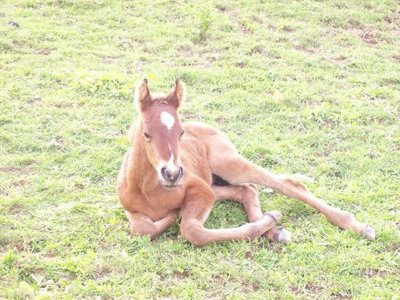 The gestation period for a horse is 10-12 months... So come next Spring I might have a foal to contend with. But for now, we shall explore the costs of just bringing Starlight home. I have estimated high for some of these items, but I think It will be pretty accurate. I have already paid the deposit for key (for access to the pasture), and I do not NEED to do a pregnancy test - so that can wait a few months or longer. I will have to do vaccinations and pay for her first months board. I would like to offer my cousin, who is driving her to calgary, $50 for his trouble. He is coming to Calgary anways - but in hauling a trailor with a 1500lbs animal, he decreases his fuel economy some. Im also assuming that I will start spending at least $30 more a month to visit Star. She is only about a 20 minute drive from the house, but if I go out often, which I intend to do, Ill have to pay for it in gas. I do need to buy some new tack, but It may cost as little as $75 - I will need some brushes, bug spray, wd40, vaseline, gloves, new boots - oh wait, new boots. I will need about $200 for new tack. Okay - so, now I have to come up with about $700. Great. That was a little pessimistic... Realistically, I have to come up with about $500. So, I reallllly enjoyed my camping trip!! I even had some great conversations about money! I talked to Jordan about some ideas that came up while camping - and I have decided (with his support) to use my emergency fund to help pay off my Visa once and for all. Jordans income could cover all the bills if I were to lose my job (with nooo wiggle room) - and we have over $3000 in our house fund. So IF IF IF I were to lose my job, he said we could use the house fund temporarily. I know, I know - I NEED an emergency fund. Yes, thats true. However; I think whats most important right now is getting rid of this credit card debt. I beleive I am experiencing debt fatigue.... I have had this stupid credit card debt that waivers between $2000 and $3000 for the last several years... and I am so tired of feeling sick and sad over it. After 5 birthdays this month and 3 camping trips - I managed to get it up over $2700!!! How did I do that!.... so Stupid! The items highlighted in green have already happened. Due to my horse moving to Calgary! Yes she will be moving on August 4, 2009 (and might be pregnant, but thats for another post). Ill need about $150 from my emerg fund to cover a few things, so $850 of that will go on my credit card. I have 30 extra hours coming to me this week which should be about $300. I will be banking another ten hours this week and next week that I will request to be paid out probably on August 21, 2009 if not sooner. Which may shorten this time frame. So - thats the plan (again... another plan). Once the E-fund comes through (online transfer ING to CIBC) I will cut up my credit card. I shall return on Monday! I was cleaning out the pantry a bit last night and noticed that my brother and lindsay had quite a few mason jars that wern't being used. Seeing as buying jars is what stopped me from using Gail's Jar System last time I thought about - I don't really have an exuse now. I worked through her online budget last night, and customized it quite a bit for my own needs - trying to make sure I hit everything that is in my current budget. but I kind of feel like I am. Perhaps this is really my heart saying - you promised you would stop mucking about with your budgets and just let them work. This month has been a little crazy for $ and Jordan and I have done quite a bit of flip flopping back and forth - which has made it challenging to stick to much of anything - with 5 birthdays and a couple of camping trips and I'd say the budget or the system needs to be looked at. Below, is a summary for each category - You can see that acccording to Gail - I'm over or underspending in some of her s/b columns. So my variable spending for the month is $635/month, or aabout $150/week. So - What do you think, should I go for it? Have I left anything out? So, back in March I wrote to Gail Vaz Oxlade about preparing for possible lay offs/recession. She had sent me an e-mail response within a few days, but didn't post the question on her website! Well, it would appear that she has soooo many questions in backlog as she just today posted my question and answer. I am sure that you are currently being bombarded with questions about the recession and preparing for lay offs. That said, I haven't seen a question or a post about it, so I thought I would throw this out there. The company I work with is touting the line about how this recession is actually an opportunity to refocus efforts... yadda yadda yadda and that because we are a private company we are safer than some of our competition. While that might be true, they are slowly but surely going division by division and group by group assessing business need and letting people go. I do have a budget which I am pretty good at sticking to which includes an emergency fund (building slowly at about $600 right now), and a debt repayment plan (owe about 2500 on my visa and have 10,000 plus in student loans), as well as long term savings (RRSP). So for the person(s) who have things on the right path, but just aren't there yet in terms of preparedness (3-6 months of savings and zero debt would be my goal). What should we do to prepare for a possible lay off, reduction in pay, or reduction in hours. I have read in some newspapers and other sources, that while employed, people should seek out a line of credit. Is this something you would advise? It doesn't seem right to me to seek out credit when that is what got us in this mess in the first place. Jessie, the line of credit is BAD advice. Let's say you decide to take out a $20,000 line of credit. You lose your job, exhaust your emergency fund and savings, and tap the line. Your bare-bones budget is $2,000 a month. You're out of work for five months. When you finally get a job, you're relieved, only to find you're now $10,000 in debt! If you think there may be the likelihood that you'll lose your job (which, by the way, there ALWAYS is), then you should brush off your resume, and start looking at what other opportunities may exist. You might look at ways to work part-time to supplement your full-time income and build up your emergency fund faster. Or you might look at skills or talents you have that you can turn into a small biz... every penny counts. Wow - I've posted a lot about this lately. oh well. So, I'm going to request a 30 hour OT payout for the next pay period (July 24, 3009). Then on that pay date, I should have about another 30 that I can request. I'm tired of waiting, and I really want to see some $$ for all of my extra work. In two weeks, I'll let you know how much extra funds I actually get and update you on my VISA progress. I couldn't help myself - I went to the CRA website and looked up their Payroll Deductions Online Calculator. According to them (which i figure is pretty accurate) I'll get abooout an extra $300 because of the masses of deductions that an extra 30 hours gives me (pushes me into a higher tax bracket). *sigh.... half, I'm losing half. If taxes and deductions didn't exist I would get $602. But - $300, is $300 - and it will help. I'll keep putting in OT and hopefully beat this credit card beast down. We have a new roomate. Her name is Samanatha! She is a 25 year old art/design student at the same school that Lindsay goes to. This means that the four of us will now be paying $250/month each instead of $375/month each. That's a serious savings of $125/month each!! It will also save us about $20 - $25 a month each in utilities. So yea! This is perfect, perfect timing - with moving my horse to Calgary, this will just about pay for it. So yay! I really didn't want another roomate - I was really enjoying living with just the three other. I figured the extra $$ would be nice, but it's not the end of the world. Since I learned that I would have to move my horse to Calgary, I realized that I really am going to need the extra funds - so no matter how much i like my space (and everyone here is sacrificing, we all lke our space), it's going to be worth it. The girl seems pretty nice too - chatty, friendly. She's a student so come september, she'll pretty much be a hermit (her words) -because of the type of education she's getting and how much time she'll have to spend on the computer. So yea! Everyone else (Nelson, Jordan & Lindsay) will have some extra cash in their pockets, and i'll pretty much break even. I think that'll be pretty nice all around. I was chatting with my mom about ways to save money and/or make money and she thought I should do a post about the expenses associated with the varying methods to get to and from work to see if there was an opportunity to save there. Due to the distance, I explored driving (what I currently do), transit, and biking (i excluded walking). On face value, and cost alone - it would make sense to bike. That said, I could only bike for 3 or 4 months in the summer - and it would add an extra 4 hours to my day. Considering I'm trying to work OT and I'm bringing my horse to the city - I don't want to give up that much time. So then we can look at transit and driving. Again - on the surface it would make the most sense to take transit. I would save about $86/month. That said, if I started taking transit to work - it doesn't mean that I would stop driving my car. I still need transportation for traveling to visit my family, for driving out to see my horse (soon), for buying groceries ect. I need that independence. In the chart above, I used $25/gas for driving to and from work - which I think is pretty accurate. In a month I probably spend about $50/month in total. In this chart I increased the amount of Gas to consider driving as well as my day-to-day driving around. To summarize, I think that if I took transit to work and kept my car. I would spend $104/month more then I do now. In this chart, I kept gas at $25, assuming that I wouldn't be driving to work, but would everywhere else. So - there you have it. I'll just keep on driving and continue to shun transit. So far, I feel a little behind on the OT for this week. I've banked another 4.5 hours so far. If I want to meet my target of 10 hours I need another 2.75 for Thursday and Friday. I beleive that I'll be getting up at 5:30, not 6:30 for the rest of the week. I'm going away again on the Wed/Thurs/Fri of next week - so that one will be a wash as well in terms of banking overtime. But I should be ablet to do another 10 and 10 for the last two weeks of the month - if I can keep myself busy. I don't think I have another 25 hours of OT. So, perhaps I will request a pay out when I reach 37.5 (half of my goal) - and then slowly work my way up to another 37.5 - if possible. I think sometimes - I set myself for these perpetual states of not reaching goals....I tend to make them juuust out of reach. Going to go look at another farm tonight - this guy wants $150/month - no matter the season. He is on the other side of the city (on my home town side). I have far too much stuff going on in my head. I’m trying to be very calm, and just figure things out (to do with my horse) at a reasonable pace; however now that I’ve made the decision to bring her home – I want to do it straight away. I know that I don’t need to worry about saddles and other gear b/c my parents didn’t sell my gear (just theirs), so I should be able to pick that up from them within the next couple of weeks. I’ve arranged to look at two different places. One has pasture ($90/month in the summer and $150/winter), the other is paddock – which is just smaller parcels of field, I think – ($150/month). Both places seem to have options in terms of keep tack (saddles, bridles etct) in locked barns, but it will be interesting to see the difference. I think they are both pretty similar in distance too, but on opposite sides of the city. I’m also thinking that I might need to buy my own horse trailer (I’m thinking anywhere from $1000-$3000), but I’ll need to talk to my parents about that, in case I’m getting ahead of myself. But realistically – if she’s in Calgary, I’m going to need to be able to move her around, take her to different farms if necessary… bring her to different places to ride….what if there was an emergency and I had to get her to a vet…. I’m not going to sell her, I’m just going to figure this out. Well I have found a few options for my horse that are less expensive then I originally anticipated. I THOUGHT that I would find something for around $500/month. 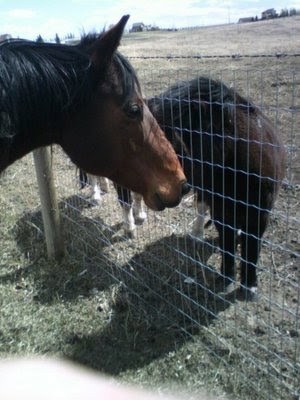 I beleive I may be able to find somwhere to board her (with feed included) for about $150/month. I still need to go check out a couple of the farms I called - but we shall see. Someone came to check out our room for rent on Saturday, he said he would get back to us by Sunday evening and unforutnatly we didn't hear from him. I'm going to call him this afternoon to see if he decided or not. Jordan had a great birthday yesterday, we were pretty low key - I cooked a lot (including two birthday pies). He wanted ribs and baked potatoe for his bday supper. He loved his presents too! $$ wise things are going okay - I still owe myself a few hundred bucks on my credit card, and I'm hoping i can put it away soon. I put a few extra $$ on it already because of the GST rebate and other such things. I just realized it's the 6th of the month - which means I can check online and get all of the utility bills. which means I'll get $$ from my roomates for those within the next couple of days. we went to the calgary stampede on saturday. saw a girlfriend of mine and a few of her friends - did some wondering, bought some things, just hung out mostly. it was fine - but it was really the same 'ol, same 'ol. Nothing all to spectactular. Jordan paid for everything and my aunt gave us the tickets so that was pretty excellent (I bought beer for drinking on J's birthday yesterday). I think that's just about everything for my weekend update. I'm going to try to bank another 10 hours this week. I think that very soon I'm going to run out of OT tasks I can complete at work. So I may not reach my 75 hours. I will still be happy with myself if I do every thing that is offered/I can come up with, for OT. It feels so nice to be back home, sleeping in my own bed! If only I could have taken a vacation day from my vacation - ah well. I few other PF bloggers that I read have posted June goal re-caps and July goals. I thought perhaps I might do this, but realistically I have so much going on in July it won't happen. So instead of setting myself up for failure, my only July goals will be to continue to use my credit card less and less, and try to be calm and relaxed about my budget/plans. You see, it was just J's mom's birthday, this weekend is his birthday, the next is his brother's, the next is mine, and the next is my mothers - phew! 5 Birthdays, one after the other! I'm going to try to be reasonable in my spending however; one of my greatest challenges is NOT spending money on other people. I find a lot of joy in making other people smile. I'm already looking forward to our next camping trip which will be closer to home and with my parents. I get home sick pretty regular, though I'm generally pretty good (at least I think I am) at hiding it. So I'll get to hang out with them and a few other family friends from the 15th to the 19th! It'll be really nice. hmm.. what else is going on in terms of an update. I'm starting to look even harder for a roomate, there are some life circumstances coming up that would make having an extra $125/month very handy. Once of these is that I may have to sell/move/give away my horse. I've had her since I was 12 years old. 13 years is a long time to be faced with losing a friend. You see, my parents no longer have horses and she was staying with relatives - but it seems they are no longer able to use her. I'm going to do some research in Calgary about costs associated with boarding horses, but last time I did that it was about $500/month. I can't afford that right now. My only hope of keeping her will be to find someone who already has horses and a large field with a stream running through it where she can stay. If all I have to pay for is feed in the winter, it should be fair to pay $150-175/month (hense a roomate is now more important for me then it was). So I guess I have some serious financial/committment things coming up. I feel kind of sad, like I'm mourning her already. Here is a picture of her, not the best quality - but it'll do for now. She was trying to make friends with the shetland pony next door. Side bars have been updated, that's unforutnatly all i have time for this morning. I will write more later on this evening.